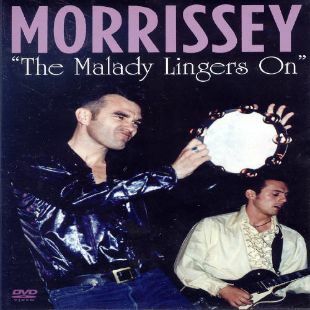 The Malady Lingers On is a half-hour collection of music videos released by Warner in 1993, featuring the beautiful creature Morrissey. Includes videos for the songs "Glamorous Glue" (shot in Chicago, IL), "Certain People I Know" (shot on the beach), "Tomorrow" (shot in Nice, France), "We Hate It When Our Friends Become Successful" (shot in London), "My Love Life" (shot in Arizona), "You're the One for Me Fatty" (featuring live clips and a dating skit), "Sing Your Life" (live show featuring Chrissie Hynde), and "Pregnant for the Last Time" (a promo for the Kill Uncle tour). Directed by Tim Broad, George Tiffin, and Zack Snyder. Many of these videos are available on the Oye Esteban! DVD released on Warner in 2000.